Hon. Layn R. Phillips - Mediator & Arbitrator based in Corona del Mar, California. If you’d like a list of available dates for Layn Phillips, please submit a request below. You will hear back directly from Layn's assistant, Michael Magill. Judge Phillips was born and raised in Oklahoma. He attended undergraduate school and law school at the University of Tulsa in Tulsa, Oklahoma, and Georgetown University Law Center in Washington, D.C. In 1977 he joined the Federal Trade Commission's Honors Program and was assigned to the Bureau of Competition in Washington, D.C., where for the next three years he investigated and prosecuted civil antitrust cases involving mergers and monopolization claims. He joined the United States Attorney's office in Los Angeles in 1980 as an Assistant United States Attorney, serving as a federal prosecutor in the Central District of California for four years. During the Reagan administration, he returned to his home state of Oklahoma, where, at age 31, he was nominated by the President to serve as a United States Attorney. At age 34, he again was nominated by President Reagan to serve as a United States District Judge in Oklahoma City. During his four years on the bench, he presided over more than 140 federal trials in Oklahoma, New Mexico, and Texas. 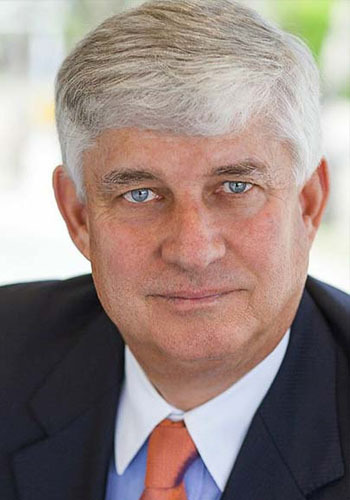 While serving as a federal judge, Mr. Phillips gained extensive experience in the realm of Superfund litigation, presiding over one of the largest CERCLA cases in the United States. He also sat by designation on the United States Court of Appeals for the Tenth Circuit in Denver, Colorado, where he participated in numerous panel decisions and published several opinions in the fields of criminal law and civil rights. For his years of commitment to public service, in 1989 he was named as one of the 10 Outstanding Young Americans by the U.S. Junior Chamber of Commerce. In 1991, he resigned from the federal bench and joined Irell & Manella, where he specializes in complex civil litigation, internal investigations, and alternative dispute resolution. As a result of his trial work, in 1997 Judge Phillips was elected into the American College of Trial Lawyers. In 1999, he was inducted into the International Academy of Mediators. Mr. Phillips has also been active in a variety of continuing legal education activities, including serving as the president of two American Inns of Court. He is a recent past president of the Federal Bar Association in Orange County, California. He is also a past member of the Orange County Bar Association's Judiciary Committee. Judge Phillips is currently serving as Co-Chair Elect of the Central District's Lawyer Representatives to the Ninth Circuit Judicial Conference. Judge Phillips attended undergraduate school and law school at the University of Tulsa in Tulsa, Oklahoma and Georgetown University Law Center in Washington D.C. In 1977 he joined the Federal Trade Commission's Honors Program and was assigned to the Bureau of Competition in Washington, D.C., where for the next three years he investigated and prosecuted civil antitrust cases involving mergers and monopolization claims. Judge Phillips has mediated hundreds of disputes referred by private parties and courts, and has been appointed a Special Master by various federal courts in complex civil proceedings. He has also served as special counsel to numerous corporations, conducting a wide variety of internal investigations on sensitive issues. In addition, Judge Phillips has also been nationally recognized as a mediator by the Center for Public Resources Institute for Dispute Resolution (CPR), serving on CPR's National Panel of Distinguished Neutrals. He is also recognized as a Charter Member of the National Academy of Distinguished Neutrals.